Sometimes two plants flower side by side and enhance each other so much. The whole is far greater than the sum of the parts. Complementary colours blue and yellow present great partnerships. A blue Anemone blanda teamed up with a native Primrose stops me in my tracks every day as I wander along the grass path by the Spring Garden, they are simply perfect together. They mingle happily with old garden tool bits we dug out of the ground when we first developed our garden. 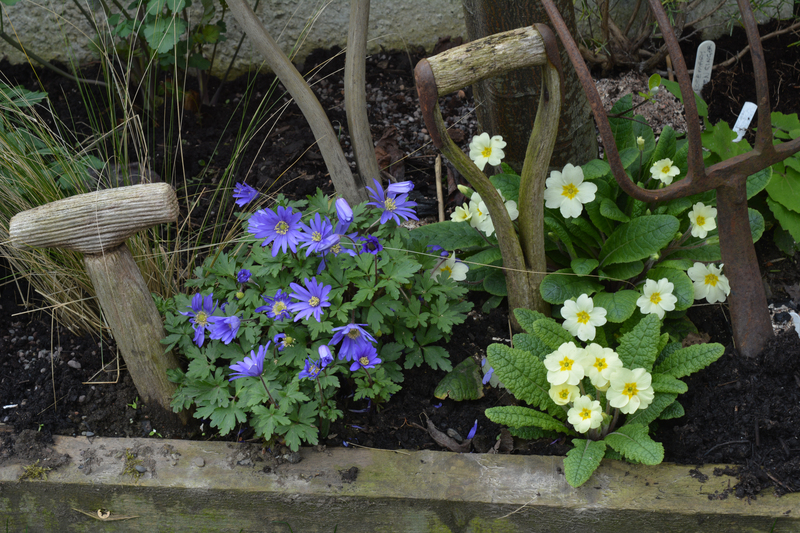 This entry was posted in colours, garden design, garden photography, gardening and tagged anemone blanda, anemones, colour, colour combinations, colours, complementary colours, March, March garden, primroses, spring, spring flowers. Bookmark the permalink. That’s what it’s all about: two modest plants come together to make something special.